JACKETS and jumpers were ditched for sun cream and shades as the sun eventually made a welcome appearance on the opening day of a truly global 2018 Equi-Trek Bramham Inter-national Horse Trials. Organisers are hoping that Yorkshire’s premier eventing fixture will attract about 60,000 spectators over the four days with visitors flocking to Bramham Park from far and wide. Bramham Horse Trials Day 1...Molly Kaye aged 5 with her sister Evie aged 2 from Rawdon, are pictured enjoying the day at Bramham. 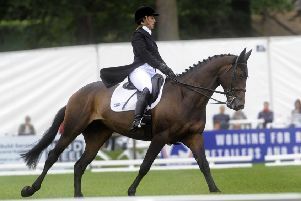 Bramham’s three main competitions have attracted top-class eventers from all over the globe and Camille Kruger became the first rider from Zimbabwe to compete on the Yorkshire grounds with her opening-day dressage test on Biarritz II. – are battling it out at this year’s Bramham, which began quietly under grey skies on Thursday morning. But the bars, Pimm’s tents and ice cream vendors were soon enjoying a roaring trade as a decent opening-day crowd sipped in the afternoon sunshine with Germany’s Rio 2016 Olympics silver medallist Julia Krajewski setting a new Bramham record dressage score of 19.4 on Chipmunk FRH in the event’s flagship CCI three-star. Hoards of spectators are now expected over the next three days with admission free after 4pm this afternoon for late-night shopping until 8pm. 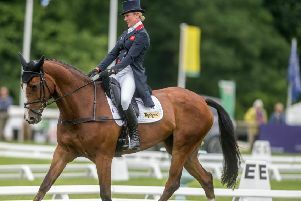 Ten riders are representing Yorkshire across Bramham’s three main eventing competitions with London 2012 silver medallist Nicola Wilson the county’s main hope in the CCI three-star competition on One Two Many.